Whitley, 9 September 2012 – Land Rover has announced the launch of the All-New Range Rover, the world’s most refined and capable SUV. 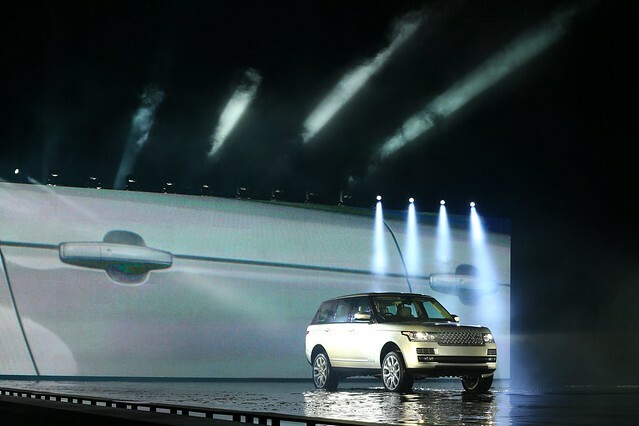 The fourth generation of the iconic Range Rover line, the new model has been revealed to the world via a dramatic event held at The Royal Ballet School inRichmond,London. The All-New Range Rover is the ultimate luxury SUV, following the innovative spirit of the original design from over 40 years ago. The world’s first SUV with a lightweight all-aluminium body, the new Range Rover takes the capabilities of the marque’s flagship to a new level, with even greater luxury and refinement, enhanced performance and handling on all terrains, and significant advances in sustainability. “Launching the all-new Range Rover represents a major milestone for Land Rover, being the first exciting output from an unprecedented investment in premium vehicle technologies,” said John Edwards, Land Rover Global Brand Director. With order books now officially open and sales scheduled to start in late 2012, the all-new Range Rover will be introduced in 170 markets worldwide. Designed and engineered at Land Rover’s development centres in theUK, the new Range Rover will be produced in a state-of-the-art new low-energy manufacturing facility atSolihull,UK. Over £370million ($586 million) has been invested in theSolihullplant to create the world’s largest aluminium body shop. At just under 5m long, the new Range Rover has a very similar footprint to the outgoing model, but with a smoother and more streamline profile – the most aerodynamic Range Rover ever. To enable customers to create their perfect bespoke vehicle, the unique luxury ambience of the new Range Rover can be extensively tailored with an indulgent choice of colours, finishes and special details, from the immaculately-trimmed colour-themed interiors of the exclusive Autobiography series, to the stylish range of alloy wheels up to 22 inches in diameter. The all-new Range Rover has been engineered from the ground up to be the most refined, most capable Range Rover ever. With the adoption of the latest body and chassis technologies, the vehicle’s all-terrain performance has moved on to another level, both in the breadth and accessibility of its off-road capability, and its on-road handling and refinement. Amongst the industry-leading innovations is a ground-breaking next-generation version of Land Rover’s Terrain Response® system, which analyses the current driving conditions and automatically select the most suitable vehicle settings. The new Range Rover’s unmatched breadth of capability is also reflected in its tremendously strong structure with enhanced body geometry for all-terrain conditions, wading depth which has improved by 200mm to 900mm, and its position as the best towing vehicle in its class with a 3,500kg trailer capability. To ensure exceptional durability and reliability, the new Range Rover has been subjected to Land Rover’s punishing on- and off-road test and development regime, with a fleet of development vehicles covering countless thousands of miles over 18 months of arduous tests in over 20 countries, including the Middle East at the Product Development Test Facility in the UAE, with extremes of climate and road surfaces. The All-New model has been engineered to meet the highest luxury car standards for refinement. True to the Range Rover DNA, the new model features the unique Command Driving Position, placing the driver in an elevated, upright seating position – typically over 90mm higher than other premium SUVs – to provide a supreme sense of confidence and control. Continuing Jaguar Land Rover’s leadership in aerospace-inspired, high-performance lightweight structures, the all-aluminium body enables the new vehicle to significantly enhance both performance and efficiency. The weight saving helps the 510PS LR-V8 Supercharged model to accelerate from 0-100km in just 5.4 seconds (0—60mph in just 5.1 seconds), an improvement of 14% over the outgoing model. At the same time, fuel consumption is cut by 9 per cent. The lighter structure has also made it possible to introduce the sophisticated 3.0-litre TDV6 engine into the model line. With performance just as strong as the previous 4.4-litre TDV8 Range Rover, the smaller engine takes the total weight saving up to 420kg, and delivers a dramatic 22 per cent reduction in fuel consumption and CO2 emissions, achieving figures of 7.5 lit/100km (37.7mpg) and 196g/km. Surround Camera System – with T Junction view, Trailer reverse park guidance, and Trailer hitch guidance. Order books are now officially open with the first months of production expected to fill up immediately. Sales of the outgoing Range Rover remain extremely strong. In the last 12 months Land Rover has sold more vehicles across its range than in any other rolling 12 month period, retailing nearly 280,000 units world-wide.